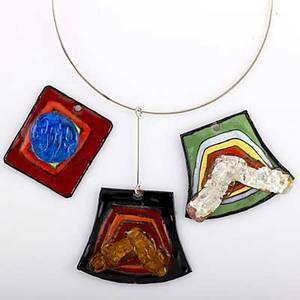 Pierre cardin couture futuristic pendants two bold colorful enameled copper and fused glass pendants with metal torque, ca. 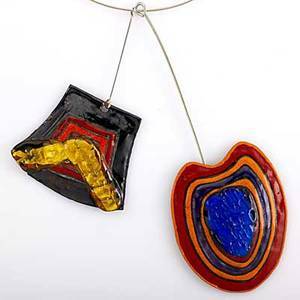 1970. both signed, smaller marked pf42 #109; larger: 4 1/4"
Archived auctions similar to Pierre cardin couture futuristic pendants two bold colorful enameled copper and fused glass pendants with metal torque, ca. 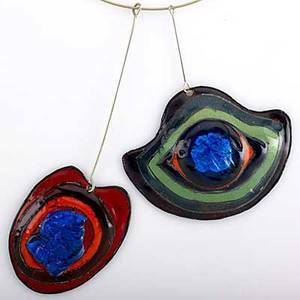 1970. both signed, smaller marked pf42 #109; larger: 4 1/4"
Pierre cardin couture futuristic pendants two bold, colorful enameled copper and fused glass pendants with torque, ca. 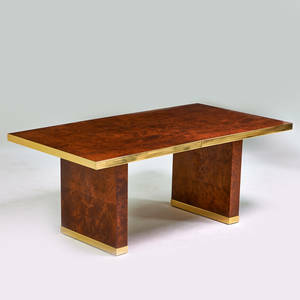 1970. both signed p. cardin, paris. 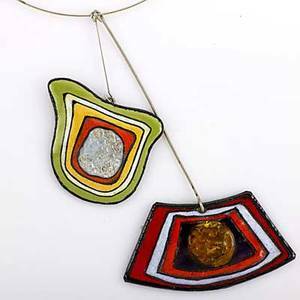 one tag pf58; largest: 5 1/4"
Pierre cardin couture fused glass pendants two boldly colored enamel and fused glass pendants with torque, ca. 1970. each signed p. cardin, paris. 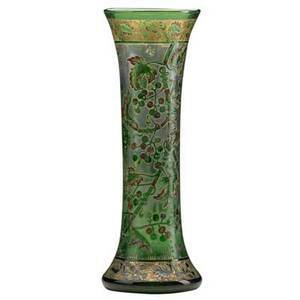 one tag pf.49 decor a.103; largest: 5"
Vallerysthal; tall acid-etched, enameled and gilded glass vase with berries and insects, france, 1880s; signed vallerysthal; 13 1/2" x 4 3/4"
Pierre cardin; dining table with two leaves, france, 1980s; maple burl, brass plated trim; etched signature; 29 1/2" x 72 1/4" x 38 1/4" each: 18"
Freeform 14k gold glass scarab pendant/brooch; iridescent glass scarab with textured gold hinged pendant bail, ca. 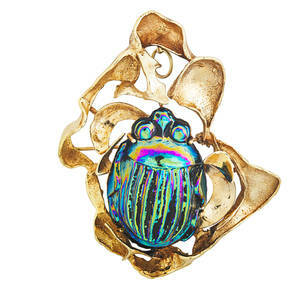 1970. marked 14k. 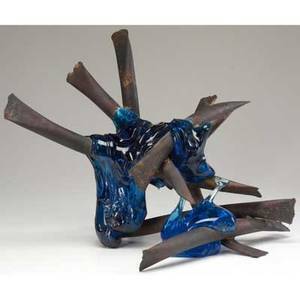 2 3/4" x 2 1/4". 20.4 dwt. 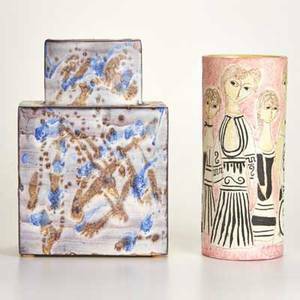 Marcello fantoni; two vases, italy, mid- to late-20th c.; ceramic with glazed interiors; both marked "fantoni / italy," one marked "for raymor"; larger: 13" x 8 3/4" x 4 1/2"
Claire falkenstein welded copper and fused glass sculpture, 1975. signed and dated. 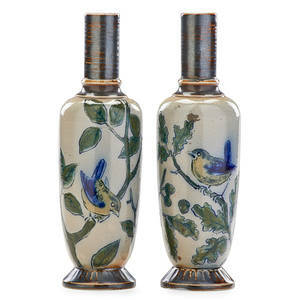 15" x 22"
Robert w. martin (1843 - 1923); martin brothers; pair of glazed stoneware bud vases with birds, england, ca. 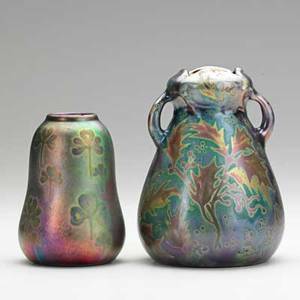 1900; both signed r.w. martin london + southall 550 and 557; 7" x 2"